There are so many great museums in St. Augustine and we want to make sure that you don’t miss out on any of them. Be sure to get your reservations in to stay at one of our fantastic Historic Bed and Breakfast Inns. St. Augustine Historic Inn Availability! Your innkeeper can help you with getting to each museum or you can check our their websites to learn more about them. We wanted to highlight a few for you. These are the top ones that we want to see, but there are even more if you are interested. Just check with your innkeeper for a list of more museums. Here is our list of the very best in St. Augustine. Take a journey back in time to the days of prohibition. The museum at the St Augustine Distillery houses artifacts from the original Ice Plant here in St. Augustine. After you peruse the museum be sure to take the free tour of the distillery and sample one of their signature cocktails made with their own spirits. You may even want to take a bottle home with you. Real Pirate artifacts are here in the Pirate & Treasure Museum. Learn about the pirates that attacked St. Augustine and other pirates that sailed the waters of the Caribbean. You and your family will be transported back in time over 300 years to Port Royal, Jamaica, at the height of the Golden Age of Piracy. Climb to the top of the lighthouse for the incredible view. Discover all of the artifacts of the lighthouse from days gone by or go behind the scenes and see authentic shipwreck artifacts recently recovered from the ocean floor being brought back to life in their conservation lab on the Behind the Scenes Tour! Explore this museum of antiquities that are mostly from America’s gilded age. You can spend the best part of the day exploring what was originally Henry Flagler’s second hotel, the Alcazar. For a unique dining experience, try the Café Alcazar for lunch. The café is located in the deep end of the original swimming pool. Discover how the Oldest House fits into the dramatic story of the nation’s oldest city, a saga of exploration and settlement, Christian missions, treasure fleets, pirate raids, wars of sieges, trade and commerce, land booms and railroads, resorts and tourism. Built by Henry Flagler in 1891 in order to move the jail so that his guest at his exclusive resorts would not have to see the jail, the Old Jail looks much the way did when it was built. Take a guided tour to learn about the many prisoners and practices that took place here. Watch in amazement as the friendly clerks, butcher and snake oil salesman demonstrate the very latest inventions for turn-of-the-century living. Step back in time and discover the latest and best time saving miracles from 1900. This museum has fascinating stories to tell about a little-known period in Florida history. Each room is meticulously interpreted to bring the past to life in a visual and entertaining way. Best of all, through ongoing research and archaeological discoveries, House stories continue to unfold. The shrine is dedicated to the first colony of Greek people who came to America in 1768. It consists of exhibits depicting the life of early Greeks in America and the development of the Greek Orthodox Church in America, and the St. Photios Chapel. Travel back in time to the Spanish Military Hospital Museum where the doctor is always in. Our 40 minute fully guided tour takes you back to colonial Spanish days of medicine. On the National Register of Historic Places it was built in 1883 as the winter residence of Franklin Smith utilizing his method of construction of poured concrete and crushed coquina shell. It is built 1/10th the scale of a section of the Alhambra Palace in Granada, Spain. In the mid 1930’s it was opened as a museum featuring the priceless antique collections of both Franklin Smith and A.S. Mussallem, which are still on display today. Located south of the Plaza at 32 Aviles Street. This section of the city was part of the original 1565 settlement established by Pedro Menendez de Aviles. 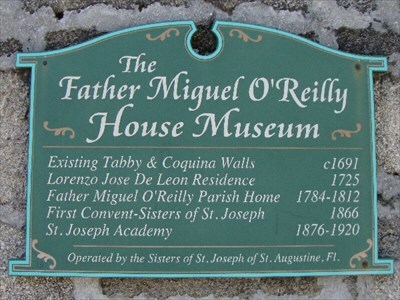 The museum, which opened on June 25, 2003, has three main themes: 1. the story of the house, circa 1691; 2. the Catholic tradition in St. Augustine, “the first parish;” and 3. the Sisters of St. Joseph who have been the guardians of the O’Reilly House and educators in St. Augustine since their arrival in 1866. A new exhibit is installed in the recently renovated lobby that explains the rich history of Government House and its prominent location in the St. Augustine historic district. The Hall of Fame and Museum, located at World Golf Village in St. Augustine, Fla., serves as a steward of the game through engaging, interactive storytelling and exhibitions featuring artifacts, works of art, audio, video and photography significant to the history of golf and its members.